A few decades ago two guys got together in what we now call Silicon Valley and started a company in a garage. Of course, you know the rest of the story. The company became famous for its innovation, the founders became rich, and many of us are using its products on a daily basis today. But this story may not have a happy ending. The company I’m referring to is not Apple Computers. It’s Hewlett-Packard. They are struggling, and having a very tough time indeed. How can it be that a company that has had such a storied past, and was the very foundation of the high-tech silicon valley, has now fallen on such tough times? This, while Apple Computers has become the world’s most successful corporate enterprise. The crux of the problem for HP seems to be that they have confused scale with success. 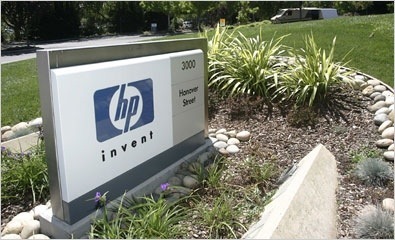 With $127 billion in annual sales HP is indeed a hi-tech behemoth, and a leader in the sale of low margin PCs. Despite the “good news” of letting go nearly 30,000 workers which the stock market used to reward stockholders with an 11% bump in the share price, HP had a 31% decline in profits for the quarter and a 3.1% decline in revenue. Beg my pardon, while I wonder out loud how a company with such a stellar background that still has the corporate tagline INVENT (see picture below), can get away with a business plan that sees the road to success in being able to purchase parts cheaper than competitors and filing for questionable tax shelters. What happened to the idea of winning in the marketplace with ideas and innovation? Bill Hewlett and Dave Packard must be turning in their graves to see the company they’ve founded trying to beat the other guys with lower costs and bigger tax breaks. In the meantime Apple, while no slouch at driving costs down or finding tax havens, has built its company based on a continual flow of new products that make our lives easier, more interesting, and more fun. This entry was posted in Business, Management and tagged Apple, Hewlett-Packard, ideas, innovation, invent, shelters, silicon valley, tax breaks. Bookmark the permalink.